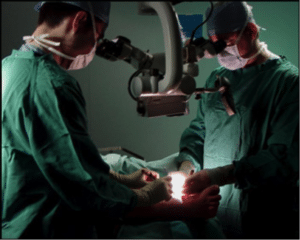 Reconstructive microsurgery is a surgical field where specialized operating microscopes and precision instrumentation are utilized to perform intricate operations on tiny structures. Utilizing magnification up to fifty times that produced by the naked eye and stitches finer than a hair, surgeons are able to repair transected blood vessels and nerves less than 1mm in diameter. The ability to reestablish continuity and blood flow to small, severed nerves and vessels has made a major impact on the potential to restore form and function to individuals impaired by trauma, cancer and congenital differences. Advances in technology and surgical technique in the early 1960s for the first time allowed surgeons to successfully replant severed digits and limbs. Reconstructive microsurgery has witnessed major advancements in the last decade including the emergence of hand and face transplantation. These techniques are providing a new lease on life for severely injured patients whose problems cannot be solved by more traditional techniques. Advanced computing and robotics continue to foster the expansion of more precise and minimally invasive surgeries while the potential to biologically engineer missing tissues and structures (tissue engineering) offer an exciting gateway to the future.